Two years ago I introduced you to the CyboInverter, a “mini-inverter” that combines the best features of string inverters and microinverters. (For more comparisons between string inverters and microinverters, click here.) In that article I wondered why they didn’t make a model that could work both on and off the grid. I guess they took my comment seriously because a few weeks ago, Dr. George S. Cheng, chief technical officer of CyboEnergy, contacted me and told me about their newest CyboInverter: a hybrid On-Off Grid inverter. Dr. Cheng believes that CyboEnergy’s multimode mini-inverter is the only one of its kind in the industry, so let’s take a look at what it does. Many grid-tied hybrid renewable energy systems combine wind turbines and photovoltaics, and there’s a growing movement to include behind-the-meter storage as well. The CyboInverter includes four inputs, each with its own maximum power point tracking (MPPT) capability. Virtually any combination of DC sources - e.g., two PV panels, a wind turbine, and a battery bank - can be connected to a single grid-tied CyboInverter. This allows the owner to produce energy, store energy, and sell it back to the grid when it’s economically beneficial to do so. All grid-tied inverters have an anti-islanding feature that prevents the inverter from putting power on the grid when the grid is down. A few string inverters also have the ability to run the house on PV or battery power in those situations - while still maintaining their anti-islanding capabilities - but they lack the benefits of microinverters: independent MPPT, immunity against partial shading, and scalability. 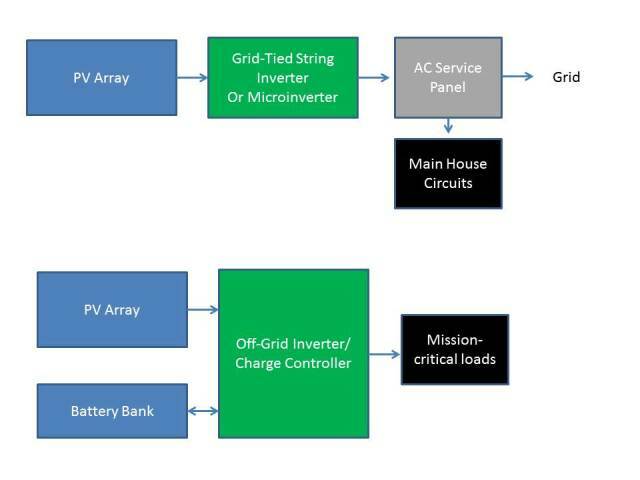 One potential compromise would be to run most of the house with PV and microinverters tied to the grid, but connect some PV and batteries to a separate off-grid inverter and use that to run mission critical loads like a refrigerator/freezer, Internet router, and a computer, as shown below. Notice that the mission critical loads are only powered by the PV and batteries, even when the grid is running. Furthermore, the power from PV and batteries cannot be sold to the grid because it doesn’t go through the grid-tied inverter. The CyboEnergy On-Off Grid inverter takes PV, wind, or batteries as inputs, and it’s also tied to the grid. When the grid is functioning, it works like a grid-interactive inverter, feeding the excess energy to the grid for net-metering. 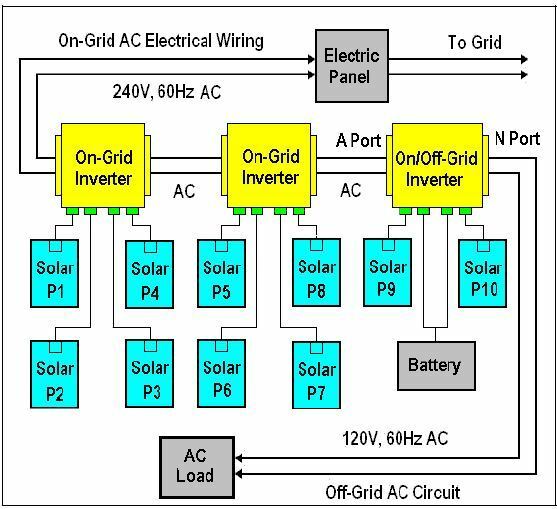 But here’s where the On-Off Grid inverter differs from a standard configuration with a separate AC load circuit: First, if PV and batteries are insufficient to power the separate AC loads, grid power can be routed to those loads. Second, if the grid goes down, the On-Off Grid inverter disconnects from the grid and powers the off-grid circuit separately, delivering up to 1.2 kW of power per inverter. (Multiple On-Off Grid inverters can be daisy-chained if more than 1.2 kW is required.) The homeowner gets all the benefits of net-metering plus a backup source of power when needed. CyboEnergy recently demonstrated their new On-Off Grid CyboInverter at Intersolar on July 14-16, 2015 in San Francisco, California. Click here for the event press release.